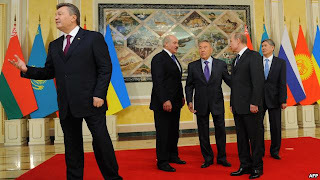 ASTANA, Kazakhstan -- Officials at a meeting of the governing board of a Russian-led Eurasian customs union say Kyrgyzstan will join the grouping and Ukraine will be granted observer status. 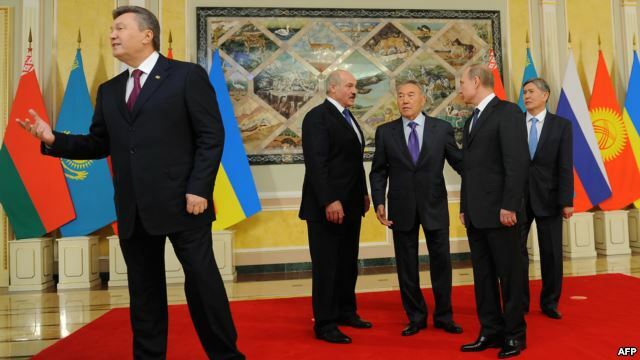 Presidents Viktor Yanukovych (L) of Ukraine, Alyaksandr Lukashenka of Belarus, Nursultan Nazarbaev of Kazakhstan, Vladimir Putin of Russia, and Almazbek Atambaev at their meeting in Astana on May 29. Kazakh President Nursultan Nazarbaev announced the changes on May 29 after the gathering in Astana of the Supreme Eurasian Economic Council -- the governing body of the Customs Union of Kazakhstan, Russia, and Belarus. Nazarbaev told journalists that experts are now working on a road map that would allow Bishkek to join the group by 2015. Documents granting Ukraine observer status in the Customs Union will be ready by autumn 2013, the Kazakh president added. Ukrainian President Viktor Yanukovych told reporters in Almaty that a memorandum on his country’s observer status will be signed in Minsk on May 31. Nazarbaev says the Eurasian integration process through the Customs Union is a purely economic process and has nothing to do with politics. Economic integration will not affect the political independence of member states in any way, he insists. The United States has expressed opposition in the past to what some regard as Russian-led efforts to reintegrate in the region. Then-U.S. Secretary of State Hillary Clinton said in 2012 that "it's not going to be called [the U.S.S.R.], it's going to be called customs union, it will be called Eurasian Union and all of that." She suggested that U.S. officials were seeking ways to "slow down or prevent" such moves. Sergei Glazier, an adviser to Russian President Vladimir Putin, said in Astana on May 29 that Ukraine's decision "to resume its integration into Eurasian economic structures" cannot be carried out along with Kiev's European Union association bids. But Ukrainian Deputy Prime Minister Yury Boiko told journalists after the summit that he does not expect any objections from the European Commission over Kiev's plans for observer status in the customs union. Ukraine has been considering Euro-Atlantic integration as its primary foreign policy objective since the mid-1990s. The European Union's Partnership and Cooperation Agreement with Ukraine went into force in 1998. This week's summit between the Kazakh, Russian, and Belarusian presidents also included participation by Yanukovych and Kyrgyz President Almazbek Atambaev. The summit focused on further integration and plans to form a Eurasian Economic Union by 2015 -- a bloc they say would be modeled after the European Union. Nazarbaev said the one of the documents approved at the gathering will serve to enlarge the range of the Customs Union's trading partners. Leaders at the Astana summit also approved plans to create an integrated information system that would detail trade between members of the Customs Union and with other nations. They also agreed to cooperate together on the creation of statistical reports.